This bronze ewer (or tripod laver) dates from the early fourteenth century, it was found on the Gower and is intact except for a hinged lid, which is missing. 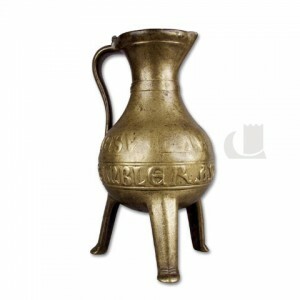 Known as the Gilbert Ewer, it is inscribed in Lombardic capitals, “IE SVI LAWR GILEBERT KI MEMBLERA MAL I DEDERT” which in translation reads, “I am the ewer of Gilbert, who carries me off, may he obtain evil from it”. A symbol of a cross precedes the inscription, this was often the practice on inscribed church bells, possibly indicative of it having been made by a bell-founder. Otherwise there are no records to account for where it was found, when or by whom. Ewers were used by guests, during banquets, to wash their hands between courses, a custom introduced by the returning Crusaders, before the invention of forks. This ewer belonged to Gilbert de Clare, Lord of Glamorgan, who was killed at the Battle of Bannockburn in 1314. Ironically, his rule as Lord of Glamorgan is notable as a time of peace and stability.